Conservatives hate the idea of the lame duck session so much that many of them are willing to support a six-month continuing budget resolution at a higher spending-level than called for in their sacrosanct Ryan Budget. 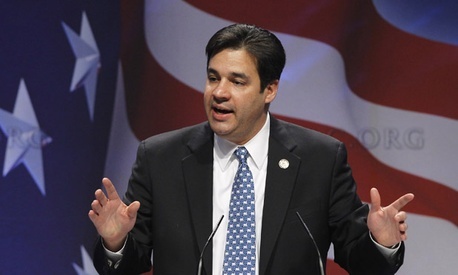 "This is conservatives saying that we're willing to vote for the 1047 number," said Rep. Raul Labrador, R-Id., in reference to the $1.047 trillion discretionary spending caps set by the Budget Control Act. "This is the number that we all have voted against until now. We're saying that in order to prevent a crisis we are willing to vote for that 1047 number. But let's get to the next year." As Republicans internally discussed the possibility of voting on a CR to avoid a possible government shutdown before the election, there were questions about whether the most conservative members would come on board. Labrador, speaking at a press event called Conversations with Conservatives, said that many of his colleagues would support an extension, but only if it was six months. That would fund the government through the lame duck, but wouldn't lock them in to the higher level of spending much beyond that. "Anybody that would not vote for a long term CR that puts government funding passed the election, passed the lame duck, then their desire is to hold the American people hostage and the hold American government hostage to get their last minute liberal push for bad policy," said Rep. Jeff Duncan, R-S.C.
Part of this plan is clearly to get ahead of the Democrats in the blame game for who is most holding the country hostage: "This idea is going to come from the conservatives, because if you listen to the Democrats they're saying it's the tea party conservatives who want us to get to a government shutdown. We don't want that and we're going to do everything we can to prevent that," Labrador said. The idea, in other words, is basically to skip the lame duck session, so Democrats don't have the ability to go forward with their agenda ahead of a possible Republican-run Washington. As Rep. Jeff Landry, R-La., put it, he' d be willing to support the CR as a trade off for "not having the lame duck session."